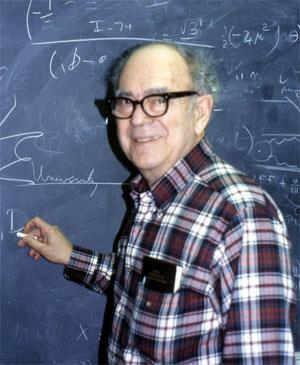 Professor Emeritus of Physics David Lazarus, 90, died on September 8, 2011, his 90th birthday, at his home in Urbana, Illinois. Lazarus was born in Buffalo, New York, on September 8, 1921, the son of Barney and Lillian Lazarus. He married Betty Ross in 1943; she died in March 2009. A distinguished condensed matter experimentalist, Lazarus earned his bachelor's (1942), master's (1947), and PhD degrees (1949) from the University of Chicago. His studies were interrupted by World War II service at the Harvard Radio Research Laboratory (1943-1945) where, as part of the Special Reserve of the War Manpower Commission, he contributed to the development of airborne radar jamming devices. He was the holder of three patents on "slot" antennas for aircraft. Lazarus was recruited to the Department of Physics at the University of Illinois by Frederick Seitz in 1949 as an instructor, a part of Wheeler Loomis' strategy to establish a world-leading research effort in solid-state physics in Urbana. Lazarus was promoted to assistant professor in 1951; to associate professor in 1955, and to professor in 1959. He retired as professor emeritus in 1987. A pioneer in the study of diffusion in solids, Lazarus and his students made seminal contributions to understanding the fundamental physics of lattice vacancy and motion and other diffusion-related issues. He worked closely with the diffusion group at Argonne National Laboratory for many years. Beginning in the 1960s, his group used high-pressure techniques to measure optical properties of ionic crystals. Widely recognized for his skills in the classroom as well as the laboratory, Lazarus was an outstanding teacher. He developed two popular physics classes for non-science majors at the University of Illinois and wrote, with his colleague Robert Hulsizer, The World of Physics, a high-school textbook. "Dave in the lab was an experimentalist who enjoyed designing elegant mechanical and electronic devices but was also comfortable with theory. Since he was non-critical of his students and open to unorthodox ideas, we felt free to initiate new ideas and argue about subjects not necessarily all related to physics." Lazarus and his wife Betty were intensely interested in music and the arts and were lifelong supporters of the performing arts. For decades, they made regular Chicago-opera trips with their friends Ned and Lizie Goldwasser and Peter and Shirley Axel. Lazarus was a John Simon Guggenheim Fellow and a Fellow of the American Association for the Advancement of Science. He served as the editor-in-chief of the American Physical Society from 1980 to 1991, guiding the editorial policies and practices and the emerging dominance of the Physical Review journals, Physical Review Letters, and Reviews of Modern Physics. While editor-in-chief, Lazarus, with APS treasurer Harry Lustig (MS '49, PhD '53), successfully defended the APS journals from lawsuits that sought to breach the confidentiality of the peer-review process, a legal victory that had enormous implications for scientific publishing.